This microphone is rated as original equipment but its quality surpasses expectations. It comes with a standard microphone cable end that fits most all normal players so compatibility with your machine shouldn't be an issue. 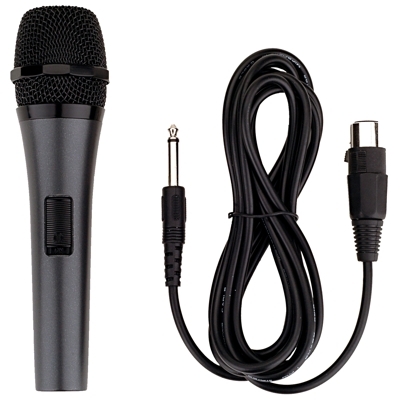 Its low price is an economical solution to the party microphone that gets bumped, dropped or broken when used by many. Save your good microphone and let the party sing with this one. Professional Dynamic Microphone with detachable cord is an economical solution to have an extra microphone on hand. It's also the perfect microphone to hand to your rowdy party guests instead of your expensive microphone.